The delivery point for WTI, Cushing, is land locked and transportation constrained. Around 2010 there were huge inventories of WTI at cushing due to increase in U.S production and limited transportation capacity, So the seller who could not find a way to transport their oil were forced to sell in Cushing at a discount. At the same time there were uncertainties about the global supplies of crude due to the agitation and unrest in Middle east and North Africa region, which gave support to Brent and WTI crude prices.But due to the landlocked feature of Cushing and increasing production of U.S, WTI could not take the full advantage and was trading at discount. Whereas Brent which was readily available was gaining momentum and started selling at a premium to WTI. 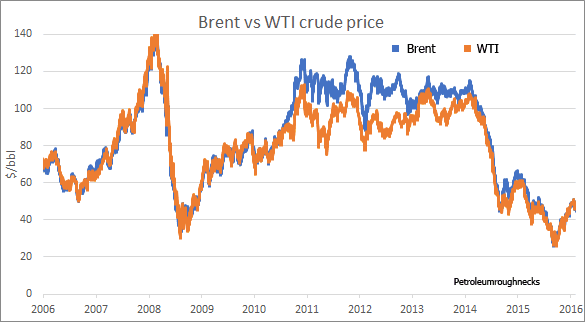 Since than this gap between Brent and WTI crude prices has widened and was maximum at 30 $/bbl around September 2011.But after 2013 there were several factors which favored WTI price and reduced the spread between the prices. Expansion of crude transportation infrastructure increased refinery access to domestically produced WTI. Pipeline capacity to transport crude to and from cushing were increased and even rail projects were completed for transportation. Crude intake of U.S refineries were also increased which further favored WTI prices. Since 2013 spread between Brent and WTI crude is decreasing and is now stable around 2-3 $/bbl.